THE LAST SUPPER is a contemporary art gallery based in the arts district in Clapham, South West London. The gallery curates works of conceptual and contemporary art with an emphasis on craft and minimalism. Established in 2014, the gallery now represents a variety of UK-based and international artists from Spain, Switzerland, Germany, France, Denmark, the Netherlands, South Africa, Japan and America. THE LAST SUPPER was founded by an artist and licensed Architect, who is still practising in both trades. Art Advisory: We have access to hundreds of artists and can help you source the perfect works for your home or office. Also, if you are looking for something bespoke from a particular artist or style of media we can help you through the commission process. Art Loan: Are you a local business that would like a curated, rotating art exhibition on your walls without having to purchase a new art collection each time? We offer a bespoke loan service to meet your needs. Bespoke framing: The gallery also runs a bespoke framing service, which has become quite popular and well respected in the community. Our commercial framer delivers museum quality framing through the gallery for our customers, artists and businesses alike. Delivery and Hanging: If you need help getting your art work home we can arrange for local deliveries. Not sure about how you would like to hang your new pieces or you don’t have the tools or technical know-how? We can do that also, for you. 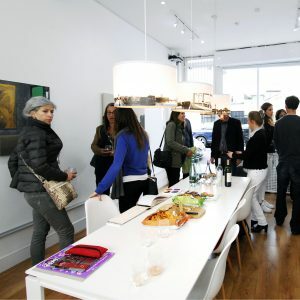 Gallery hire: Are you a pop-up or start-up that needs a space to bring your clients together. The gallery provides a clean and comfortable setting for whatever your business needs. We can stage the space with art on the walls or you can provide your own.